This triangular, slightly conical shaped bivalve mollusc shell was found on riverside sand. The faint stripes give it the name. The Â£1 coin gives scale. The Zebra Mussel has been introduced from Russia and apparently can create difficulties by clogging pipes and boat hulls. 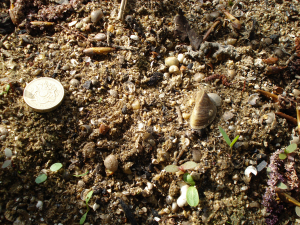 Mixed in with the sands were the much smaller Pea Mussel shells.